Fall is here and the bright colors of yellow and orange are making it's appearance around the Vail Valley. We even had our first dusting of snow on top of Vail Mountain on Monday, which means excitement for the upcoming ski season. 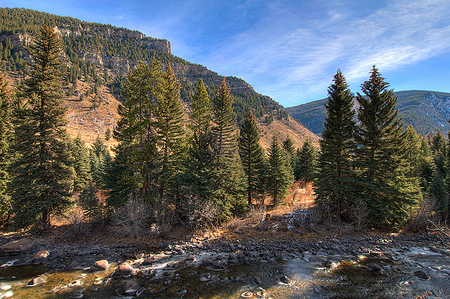 Battle Mountain and Tennessee Pass: Take I 70 to Highway 24 through Minturn and head south along the scenic byway. I have always thought this is one of the prettiest drives to enjoy the brilliant shades of gold and orange with a splash of red. Bank Owned Townhome In Minturn, CO For Sale! Check out this bank owned Minturn Townhome, 142 E. Lions Lane listed at $464,900 or $199/SF! PRICE REDUCED!? Now listed at $439,900 or $189/SF! Now listed at $409,900 or $176/SF! UPDATE Sold for $392,000: Built in 2006/2007, this 4 bedroom/4.5 bathroom end unit boasts high end finishes and a 2 car garage! The original sales price was $825,000 for approx. 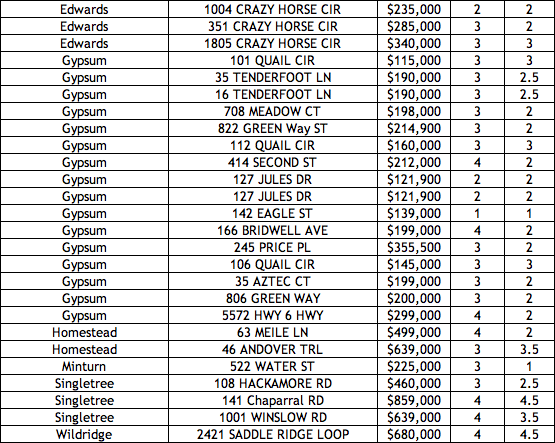 2331 square feet in May of 2007 or $354/SF. That's over 50% OFF!! 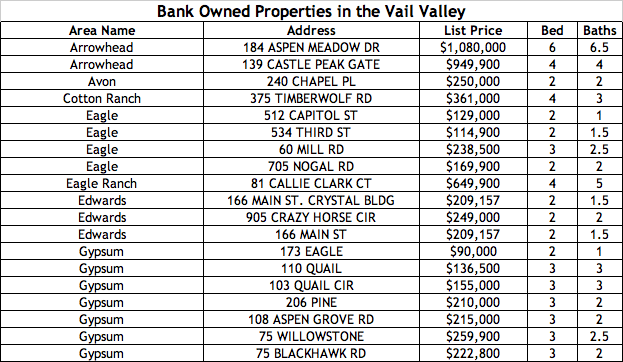 Read more about Bank Owned Townhome In Minturn, CO For Sale! Farmers Markets open this weekend for the season in the Vail Valley! The Farmers Markets open this weekend which must mean summer has arrived.? The Vail Valley has three wonderful farmers markets that are open every weekend in the summer.? Minturn Farmers?Market is open every Saturday from June 18 through September 3, 2011 from 9:00 am to 2:00 pm. The Minturn Market was the?original Vail Valley Market located in charming downtown Minturn.? In it's 13th season, the market features an assortment of items from farm fresh and organic produce, to gourmet foods, gifts, clothing, ?jewelry and fine art.? Edwards Farmers Market is open every Saturday from June 18 through September 17, 2011 from 9:30 am to 1:30 pm.? Located in the Edwards Center, the Edwards Market is an old-fashioned food and farm market.? In it's 8th year of operation, the Edwards Market specializes in natural and fresh products, focusing on high quality Colorado Farm and gourmet food products. Read more about Farmers Markets open this weekend for the season in the Vail Valley! 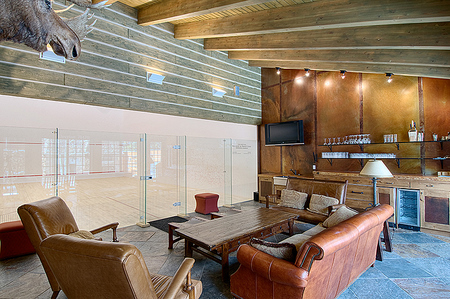 Private Squash Court in the Vail Valley! Are you looking for a private squash court here in the Vail Valley?? While there are several options?at various clubs throughout the valley, one stands above the rest for exclusivity and setting: the Minturn Racquet & Trout Club! Read more about Private Squash Court in the Vail Valley! New Businesses Open in Minturn, CO! That's right!? Several new business have recently opened in the quaint community of Minturn, CO!? 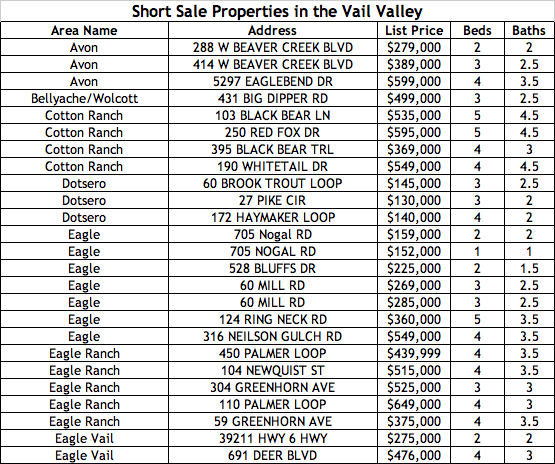 Click here?to read the Vail Daily article ?detailing the 8 new entrepenuerial endeavors.? Tucked comfortably off of I-70, Minturn sits perfectly between the world renowned ski resorts of Vail and Beaver Creek, yet it retains its historic charm as a former railroad town. Read more about New Businesses Open in Minturn, CO!